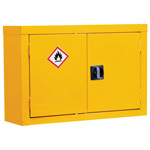 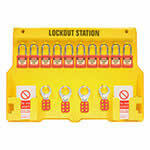 You can keep all your lockout equipment together and easily accessible inside one of these lockout stations. Designed to be wall mounted, they ensure essential lockout supplies are visible and ready to use, but the cover supplied with it also means that the whole station can itself be locked out to prevent unauthorised use. The station comes complete with lockout supplies and so provides a complete solution.